In a large bowl, whisk together the cornmeal, flour, sugar, baking powder and salt. In a liquid measuring cup, whisk together the egg and milk. Pour the wet ingredients into the dry ingredients and stir until combined. Add 4 inches of oil to a large, heavy-bottomed stock pot. Attach thermometer and let heat until 360 degrees. 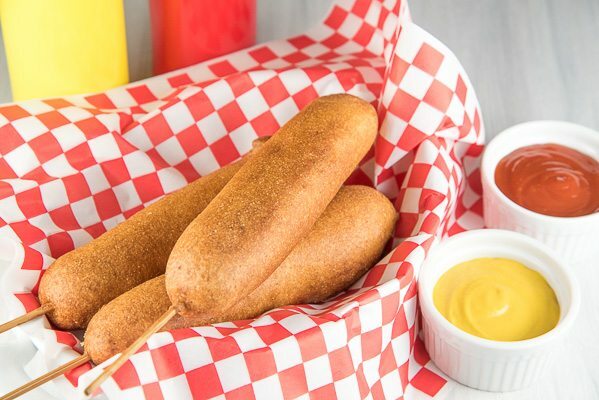 Line a plate with paper towel to drain the corn dogs after frying. Dip each hot dog in batter and fry until golden brown ( 3 minutes) . Drain on paper towels.